A split Spokane County Commission approved a $738.2 million budget for 2018 on Monday night that avoids cuts to public safety. The all-Republican panel split on whether to use money set aside from the budget for road construction to cover next year’s operating expenses, including paying salaries and benefits for county employees. Commissioners Al French and Mary Kuney approved using that additional roughly $5 million for operational expenses, while Commissioner Josh Kerns argued there was a potential for deeper cuts that would have avoided the unprecedented step of using that money for costs spread out over multiple years. The budget is not expected to increase property taxes for residents whose home values do not change next year, said Tonya Wallace, the county’s chief budget officer. The split on next year’s budget, finalized after weeks of hearings, presentations from department heads and elected officials on ways to cut spending to make up an anticipated $9.4 million shortfall next summer and a withdrawn request to increase taxes, is the latest bump in the sometimes contentious relationship between French and Kerns, who’ve butted heads in the past on issues that include Kuney’s appointment to the panel. French called the budget, which increases funding for the Spokane County Sheriff’s Office by $2.6 million over last year’s total and maintains funding levels for the office’s community oriented policing volunteer program (SCOPE), “fiscally responsible” and defended the use of the road surplus to make up other shortfalls. French acknowledged using the money cut into reserves that eventually the county would need for road projects, but said its one-time use in 2018 would allow county officials to consider longer-term financial solutions to balance spending with revenue. In the past, that money has been used for one-time expenditures, including purchasing from the city transfer stations for garbage disposal and to stabilize the county’s credit score, French said. Kerns said he approved of the funding levels for the sheriff’s office and appreciated the transparency of writing this year’s budget, but the county should have gone even further by looking at areas to cut expenses, including outsourcing some services like accounts payable and payroll. “What I think we absolutely need to do is we need to take a look at what is discretionary and what is actually mandated,” Kerns said. Kuney, who was appointed to the board by Gov. Jay Inslee after a stalemate between Kerns and French over who would succeed Commissioner Shelly O’Quinn, praised the budget for maintaining funding levels for the Washington State University agricultural extension program and the Parks Department’s conservation futures fund, which is used to purchase potential parkland throughout the county. Kuney said the county should begin discussing its budget for 2019 at the start of the new year. The budget does include cuts for some departments and programs. The county’s share of funding for the Spokane Regional Health District drops roughly $400,000 in 2018, to $2 million. District court services and the prosecutor’s office will cut back $106,000 and $88,000, respectively, next year. Spokane County Prosecutor Larry Haskell, who was on hand to watch the budget’s passage, said he was pleased with revisions made by commissioners following criticism earlier this fall that a 7 percent decrease would limit his office’s ability to pursue drug crimes. The proposed cut to his office is about one-tenth of that original proposal. 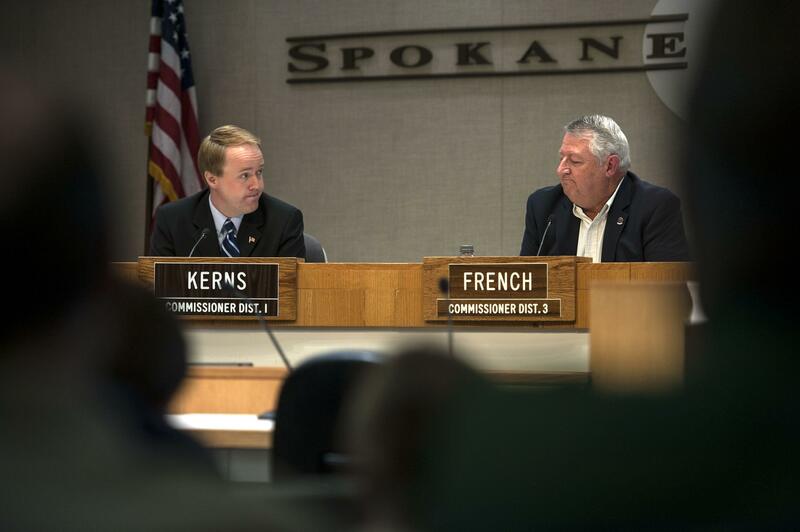 French accused Kerns of backing away from a commitment to use the road money to help close the funding gap after the commissioners retreated from asking voters to approve a tax increase this summer. “He said he would approve it in July,” French said. Kerns said he never agreed to using the money in that way. The budget was passed 2-1 with little fanfare. No public testimony was taken before the vote. Published: Dec. 4, 2017, 9:05 p.m. Updated: Dec. 5, 2017, 6:20 a.m.